‘Crafting the Façade: Reuse, Reactivate, Reinvent’ is a three-year interdisciplinary project focused on architectural issues, tectonics, and structural, cultural, social and economic themes. The aim of the partnership is to establish an intensive cultural and social exchange between the participating students and teachers of the three partner Universities, the Academie van Bouwkunst in Amsterdam, the Mackintosh School of Architecture in Glasgow, and the University of Liechtenstein, examining the subject of building envelopes and centered on architectural traditions as well as evolving construction practices and materials. The ERASMUS+ strategic partnership is directed and coordinated by Prof. Urs Meister and Dr. Carmen Rist-Stadelmann at the Institute of Architecture and Planning of the University of Liechtenstein.ting the Façade: Reuse, Reactivate, Reinvent’ is a three-year interdisciplinary project focused on architectural issues. The composition of an aesthetically and functionally sound contemporary building envelope is determined by a wide range of parameters, especially that of energy efficiency. It has become difficult to generate the architectonic shape from the logic of a single building material in a simple linear way. The multi-layered organisation of modern facades reveals that the architectural assignment tends to breakdown into various competing technical requirements. Each single layer may solve its task discretely and efficient, but the basic deficit of material expression becomes obvious in considering the whole. The dissociation of categories of architecture once closely linked or even inseparable fundamentally threatens architectural culture, since it has become difficult to establish a coherent language of architecture out of the ingredients of construction. The theme ‘CRAFTING THE FACADE: Reuse, Reinvent, Reactivate’ contains both tectonic aspects – the assembly of elements to form a whole structure – as well the potential for structural and material research of our European buildings to inform the culture of building. In using the three terms ‘reuse, reinvent and reactivate’, a clear emphasis is placed on both existing and future situations. Reuse analyses existing constructions, components and building materials. Reactivate is concerned with traditions in craftsmanship and technical aspects. With reinvent, we learn from existing buildings and try understand the potential they contain. Against the background of the climate change and the increasing need for resource efficient building, these fields of research allow provoke the rethinking of design processes, to produce innovative building envelopes that can meet the European Commission strategic targets for 2020. In the three European countries of the partnership, these issues are widely discussed and are assessed in distinctive ways. Through these different approaches, an enriching basis of knowledge arises within the project ‘CRAFTING THE FACADE: Reuse, Reinvent, Reactivate’, which is based on the experiences and insights gained in the previous Erasmus Intensive Programmes. With the intensive collaboration between students and teachers of the participating Universities of Liechtenstein, Scotland and the Netherlands in social and cultural terms as well as regarding the content, ‘CRAFTING THE FACADE: Reuse, Reinvent, Reactivate’ contributes to an important exchange of information and experiences about the topic of building envelopes and the respective traditions in architecture. The debate between different European building cultures is given by the composition of the partnership: urban structures and rural approaches meet alpine cultures of manufacturing. Shared symposia, excursions and workshops amplify and disseminate these experiences into the European scale. ‘Crafting the Facade’ is conceived as an interdisciplinary endeavour since it focuses on architectural questions, but integrates social, cultural, economical and construction issues as well. This approach is anchored within the partner Universities in the areas of design education and research, and is realised over the whole period of the programme. In the area of education, the respective themes are worked on in the design studios of the different schools of architecture. Over the three years, the programme provides the basis for close co-operation between the different partners, and for the realisation of European networking between Universities. With the mix of different teaching methods and the dialogue between academics and the building practice, the process of innovation is actively promoted and the resulting interaction has a direct effect on the future teaching within each of the architectural schools. It is the aim of the partnership to intensify and strengthen the multilateral cooperation between the Universities during the programme and in the future and to establish a long-term relationship. This will enrich the professional discourse around facades and the importance of the building envelope as a technical, cultural and social device and therefore be of significant interest to anyone involved in the development of the building culture within the European Community. The symposium aims to strengthen a tectonic approach towards the design of façade and to reposition and reassert the façade as a central element within the design process in the education of the architect. Design studios in three European Universities researched and developed façades constructed from three materials prevalent in local building tradition and culture - stone, brick and wood. Throughout the studio work, the façades were explored in hand drawings in scale 1:10 and with hands-on experiments and testing at 1:1. The intention of the symposium is to share the results of these three encounters with a broader audience, to offer new points of view and experiences from invited speakers (Bernardo Bader, Hans van der Heijden, Neil Gillespie) and to broaden the debate around the façade enabled by journalists and writers. The symposium will be of interest to students and tutors of architecture, the wider architecture community as well as Erasmus+ programme participants. Participation Fee: Free of charge. The symposium is supported by the EU/AIBA Liechtenstein. This symposium is part of the ongoing Erasmus+ programme, funded by the European commission and the National Agency of Liechtenstein. Programme partners are the Mackintosh School of Architecture in Glasgow, the Academy van Bouwkunst in Amsterdam and the University of Liechtenstein. Bricks of the Future presents the results of three ‘design through making’ studios at the Amsterdam Academy of Architecture. 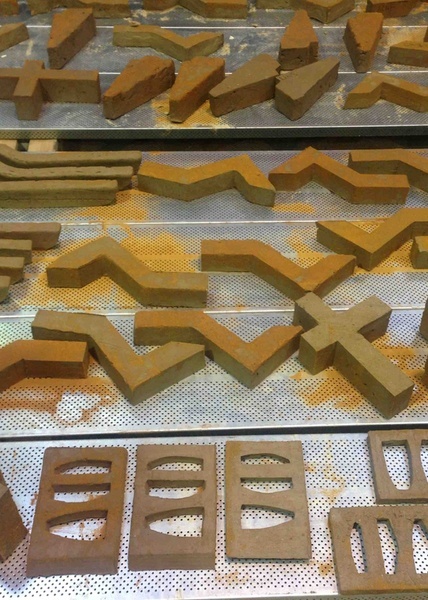 Bricks of the future is part of Crafting the Facade, a European Erasmus program. Students designed and made new bricks produced with less energy or materials,recycled materials. They stacked or assembled the bricks in an innovative way. Each studio is a cooperation with a Dutch brick factory: Den Daas in Azewijn, Zilverschoon in Randwijk and StoneCycling-St.Joris in Beesel. Bricks of the future encourages the thinking and making of new sustainable building materials. Curator: Machiel Spaan, Baukje Trenning, Jurjen van der Horst en Jochem Heijmans. Exhibition design: Machiel Spaan, Baukje Trenning, Jurjen van der Horst en Jochem Heijmans. Sponsors: Academie van Bouwkunst Amsterdam, Erasmus+ Crafting the Facade, Daas Baksteen, Steenfabriek Zilverschoon, StoneCycling en Steenfabriek StJoris. The project is supported by an Erasmus+ grant for strategic partnership for higher education.